Perennials & Sutherland, innovators in luxury furniture and fabrics, have entered into a transaction with Acacia Partners which will help the company drive continued growth and expansion. Perennials is the category creator for luxury performance fabrics, which have the look and feel of high-quality, natural materials, yet have performance characteristics such as resistance to stains, water, UV rays, mold and mildew. Sutherland Furniture was an early innovator in the outdoor luxury furniture market creating “livable art”, which has inspired the design community to make outdoor rooms a continuum of the indoors. 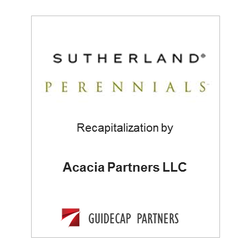 GuideCap Partners initiated the transaction and served as financial advisor to Perennials and Sutherland.